Czechs do not intend to give up their own currency anytime soon. A commentary by Leon Podkaminer. According to a recent (May 2017) public opinion poll, 72% of Czech people favour keeping their national currency while only 21% would welcome a switchover to the euro. Popular opinion appears consistent with the preferences of the Czech economic policy-makers. These preferences were unambiguously revealed in December 2015 when the Czech National Bank and Finance Ministry issued a joint recommendation not to set a target date for adopting the euro yet and thus not to attempt to enter Exchange Rate Mechanism (ERM II) in 2016. The recommendation referred to a longer document which, surprisingly, made clear that the Czech Republic was actually compliant with all Maastricht criteria (except participation in the ERM II). Formally, the Czech Republic could have applied for participation in ERM II already in 2015 (if not much earlier). Undoubtedly that application would have been accepted without reservation, if not enthusiastically (in contrast to the earlier applications of some Baltic states which had been accepted rather reluctantly). Nothing much has changed since. The most recent official assessments of the Czech Republic’s fulfilment of the Maastricht convergence criteria repeat the earlier statements as concerns the Republic’s perfect compliance with the formal requirements – and, similarly as before, see some barriers to the euro adoption. One such barrier is that the economic convergence of the Czech Republic has been unfinished. The Czech price level is still much lower than the euro area average – and so is the Czech productivity level. The second barrier is the continuing economic disarray in the euro area. This is expressed rather diplomatically: the situation in the euro area cannot be assessed as sufficiently stabilised. Is the Czech decision-makers’ revealed preference for retaining an own currency – despite the formal satisfaction of the necessary prerequisites for ERM II participation - to be viewed as an expression of their populism, that is keeping up with the prevailing public opinion? That is a possibility. However, in my opinion there are very good economic reasons why the euro adoption should not be seriously considered anytime soon. Firstly, the risk of further turbulence shaking the euro area remains substantial. The inherent flaws of the euro project have not been addressed so far – and are unlikely to be seriously addressed in the foreseeable future. In effect the euro area will continue to be exposed to the perverse effects of the one size fits all principle underlying the ECB monetary policy; and will suffer under the unreasonable emphasis on fiscal restrictiveness with the competitiveness-driven national wage policies threatening to tear the euro area apart. Given the prospect of some members introducing own currencies in a non-orderly fashion, defaulting on foreign debts etc. leading to a dissolution of the euro area it is advisable to keep away from it. Even if the horror scenario does not materialise soon, participation in the flawed euro area is unlikely to guarantee longer-term economic advantages to any of its members – including even Germany. Secondly, it is correct to pay little attention to the satisfaction of the Maastricht criteria: while non-satisfaction of these criteria is very likely to be the source of failure after euro adoption (as exemplified by the Greek experience), the satisfaction of these criteria is no guarantee of future success (this is the experience of Italy and Portugal). Thirdly, retaining an own currency that can be floated or devalued, if necessary, is obviously not without its costs. But these costs pale in comparison to the costs inherent in having currency whose value is rigidly fixed against the currencies of a country’s trading partners. 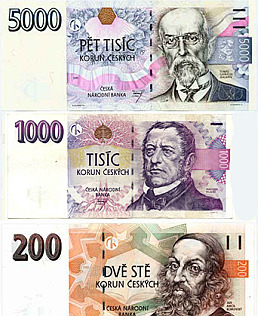 The Czech Republic (as well as Poland and Hungary) benefited hugely from the steep exchange rate devaluation at the time of global economic crisis. From July 2008 to February 2009 the CZK lost over 10% versus the euro. That was an important factor helping to limit the output losses. An own currency is a kind of insurance policy for rainy days. The Czech economic elites may be congratulated for understanding that fact very well. The article was first published at www.emerging-europe.com.